As guests enter the historic Hotel Galvez & Spa they are often greeted by a charming gentleman with a welcoming smile. This dapper gentleman is Guest Ambassador Bobby Hilton. He kindly directs patrons to the front desk, answers questions and gives tours. 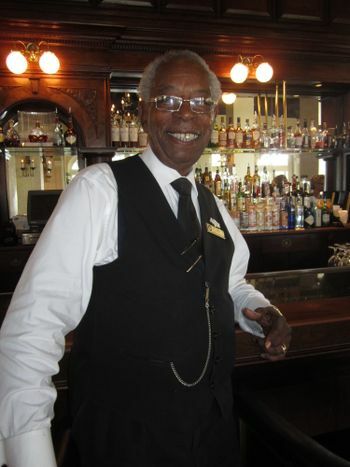 Hilton, 79, has worked at the Hotel Galvez for 17 years, originally as a lead waiter and head bartender and, in 2011, was promoted to a new guest ambassador position. Hilton was born in Galveston and in 1953 graduated from the first African American High School in Texas – Central High School. He attended Texas Southern University on a football scholarship and later served in the United States Army as both a medic and a member of the Army football team. During his 30 year career, he worked as a district manager for Galveston’s Falstaff Brewery, Schlitz Brewery and Stroh Brewing Company. Hilton provides guided tours through the hotel including the Hall of History which was added for the 2011 centennial. The Hall of History is a free, permanent exhibit that offers a history of the hotel, information on famous guests, historic photos and a display of historic memorabilia. Hilton is always happy to share a little Galveston folklore and provide tips on what to see and do. Tours are typically reserved for guests but the hotel also offers a self-guided Walking Tour & History booklet at the concierge desk which is available to the public. Group tours with Hilton can also be scheduled by contacting the front desk. During the month of October, Hotel Galvez offers a public Ghost Tour and Dinner on Wednesdays and Thursdays. These tours are given by Concierge Jackie Hasan. Hotel Galvez & Spa, A Wyndham Grand® Hotel and National Trust Historic Hotel of America, is the only historic beachfront hotel on the Texas Gulf Coast. This 224-room, century-old hotel offers 13,000 square feet of meeting space, a 9,763-square-foot spa, fitness center, full-service restaurant, lobby bar and pool with a swim-up bar. The hotel is rated four diamonds by AAA and is owned by Galveston preservationist George Mitchell as part of Mitchell Historic Properties. For reservations, call (800) WYNDHAM or visit www.WyndhamHotelGalvez.com. Galveston Island is the No. 2 tourism attraction in Texas for in-state and out-of-state travelers. Galveston is a historic beach town located just 50 miles south from Houston, Texas – the fourth largest city in the U.S. A diverse cultural town, Galveston Island is a unique destination offering 32 miles of beaches, a variety of family attractions and resorts, one of the largest and well-preserved concentrations of Victorian architecture in the country and Texas’ premier cruise port. For more information on Galveston Island visit www.galveston.com or call (888) GAL-ISLE. Bobby Hilton is guest ambassador for the Hotel Galvez.